The Law Office of David Watson, LLC provides comprehensive and individualized estate planning services. Let Watson use his knowledge of estate planning vehicles to create a plan custom designed for you and your family. 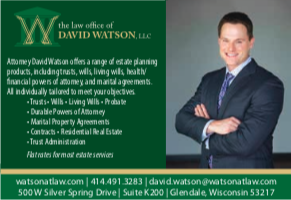 Milwaukee area estate planning attorney David Watson offers a range of estate planning services, including trusts, wills, living wills, durable powers of attorney and other plans tailored to meet your unique objectives. Most estate planning services are provided at a flat rate. Whether it is minimizing federal estate and gift taxes, ensuring the orderly transition of a family business, or providing for the needs of future generations, Watson designs custom approaches to protect the assets that you have worked hard to build. Estate planning is not only about safeguarding your life but also determining your legacy.